Earlier this month, Google CEO Sundar Pichai was interrogated by the House Judiciary Committee about the online search engine’s liberal biases. What they shared was disturbing. Google collects users’ personal data and has shared that data with the government and other entities. Recent studies have also proven that Google filters search results with a clear liberal bent, according to lawmakers. Now, search engine DuckDuckGo has joined the critics of Google — and it has data that proves Google’s unfair political bias. “Google’s collection and use of personal data, including location, which is then used to filter specific search results, is having an effect akin to the effects of a political bias,” DuckDuckGo CEO Gabriel Weinberg told Business Insider. The DuckDuckGo study found “vast differences” in search results when searching for the same keywords (like “gun control” or “immigration”). “If you live in this ZIP code, we’re going to show you the NRA. But if you live in this other ZIP code, we’re not going to show you the NRA,” Weinberg explained. He said that the effect puts “a whole ZIP code in a filter bubble,” keeping information from users. Weinberg pointed out that Google’s biased influence is vast. “You’re potentially influencing tens of millions of people,” he said. Every month, over one billion different people around the world use Google – searching for facts and answers and truth. Not only does Google directly affect them and all those they influence, but the internet superpower promotes or censors information those billion people see, wielding a power that could literally influence the course of nations. The Texas Congressman warned that Google’s power and influence is a threat to America’s freedom. “Google could well elect the next president, with dire implications to our democracy,” he concluded. The House Judiciary Committee also questioned Pichai on why a Google search for “idiot” brings up dozens of pictures of President Donald Trump. Google has a history of exerting its liberal bias to influence the masses and transform cultures. The internet superpower came out against the Defense of Marriage Act and opposed Proposition 8 on natural marriage. It even launched a worldwide campaign to spread the homosexual agenda in any country it deemed “homophobic,” such as Christian Poland. And Google’s loyalty is not always to its users. During the PRISM scandal, Google gave spying access —unconstitutional Internet-tapping — to the federal government via its internal servers. Eric Lieberman at The Stream and The Daily Caller noted Google’s “fact-checks” reinforce an anti-conservative narrative. “Google’s fact-checking services…are biased, if not also downright libelous,” he charged. TV producer David Sams streamed a study live on Facebook demonstrating that Google’s device called ‘Google Home’ refused to answer ‘Who is Jesus,’ but had lots to say about Mohammed, Buddha, and Satan. 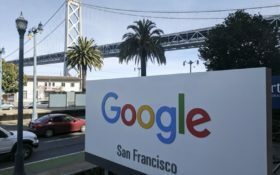 One former Google employee, Barry C. Lynn, has called upon conservatives to “fight monopolies” like Google because they threaten American democracy by censoring free speech and thought. Steve Bannon, former chief strategist to President Trump, argues that tech companies like Google and Facebook should be regulated — like utility companies are. Perhaps it’s time for Republican lawmakers to listen — and finally take action.